The Department of Communication and education deals with wide range of tasks related to marketing materials regarding the Parliament activities either in printed or in electronic version. 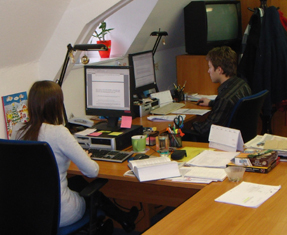 Department oversees operations of the Information center that has been launched in 2006. It acts as a contact point where department staff provides information and advise related to activities of The Chamber of Deputies. The Division for Communication and Education has prepared a product line of print materials about the work of the Parliament in Czech, English, French, German and Russian. Other products include a short film about the development and role of the Parliament and an interactive multimedia presentation of the Chamber of Deputies. These materials can be obtained from the Information Centre of the Chamber of Deputies, located in the Smiřický palace on Lesser Town Square (Malostranské náměstí). The Information Centre provides the public with information on current events in the Chamber of Deputies as well as on the functions and bodies of the lower house of the Parliament.